To most people, St. Louis, Missouri is not what they would consider to be a mecca of indie game development (in spite of the fact that I would vehemently disagree). We’re in what’s called a flyover state; a city best known for weird pizza, a big arch, and a civil revolution. Most people don’t know, however, that St. Louis is also home to one of the fastest-growing game communities in the United States. To put that in perspective, let me give you a bit of history in how our community began. As of just a few years ago, St. Louis was home to only about three known established game studios, and a small scattering of game dev hobbyists and hopefuls. In 2010, a few of my friends and I had begun making games in our free time as Happy Badger Studio, but none of us had any idea that there was anyone else in the area working on similar projects, because the local game dev scene felt virtually invisible. We felt very alone. St. Louis’ very first game jam was held in August of 2010, in a tiny office in our city’s business district. The organizers, some of whom are still actively involved in the community (I’m looking at you, Sam Coster), advertised by putting out fliers at local electronics stores. There were ten total attendees and two games made. 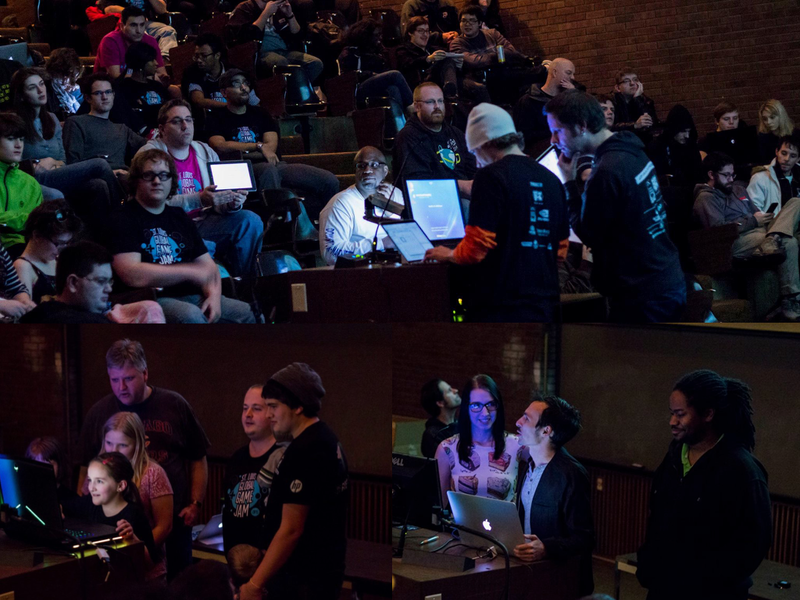 Now, let’s compare that with our most recent jam — St. Louis’ 2015 Global Game Jam site — which welcomed a very diverse 248 people who, together, created 42 games, making our jam site the 5th largest in the United States, and the 12th largest in the world. That’s pretty remarkable growth for just 4.5 years in a flyover state. 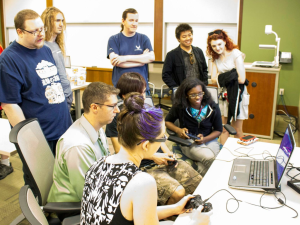 Another cornerstone of our community, the St. Louis Game Developer’s meetup group, was formed in June of 2010, around the same time of that first game jam; by the time the jam occurred, there were 8 members. As of February 2015, there are more than 700 members, with meetups regularly attended by 50-100 developers each month. At the end of 2012, a handful of us began looking for ways to support and encourage more professional development, so we worked together to create a local IGDA chapter. There were only about 10 people at the first meeting. Today, the chapter supports more than 200 members. So all these numbers are great for reference, but ultimately, that’s not what’s important about our local developers. The real strength of our community is our support for one another, our ability to collaborate with and mentor each other, and our genuine desire to see each other succeed. We have a unique game scene in St. Louis, in that there are few AAA or non-indie studios at which our aspiring devs can gain experience. We’re all starting out on the same foot, so we all share in each others’ challenges, celebrate each others’ accomplishments, and encourage each others’ creativity and growth. We’re each starting from scratch, so that means we’re writing our own gamedev rulebook, so to speak, and we’re doing it together. We all want to be able to connect with others who share our interests and passions; why else would we all look for ways to get to know like-minded people? In a city like St. Louis, it’s uncommon to run into someone else in this profession, so one of the only ways we’re able to connect with each other is through industry-specific events. In St. Louis, we started out with the aforementioned Meetup group, which meets monthly. 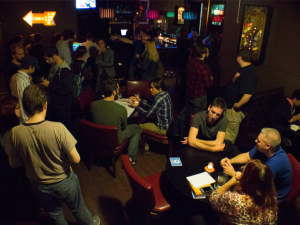 Since then, we’ve founded an IGDA chapter and a GameDevDrinkup chapter, allowing us to host three different kinds of events each month. That may seem like a lot, but we rotate between a core group of event types that, through much trial and error, have become very well received and attended. Casual events, like drinkups, parties, or networking mixers are a great way to give people a chance to meet other locals, and can be a catalyst for great friendships. Our casual events like this sometimes even turn into impromptu board game nights, as gaming works as a great icebreaker and can lead to interesting design discussions (and occasionally arguments). On the other hand, educational events are a good opportunity for the community to learn from itself, and gives community members the chance to bolster their self-confidence and assert their expertise through public speaking. Our three core educational formats are Speakers, Panel discussions among groups of professionals, and Roundtables, in which a moderator leads the whole room in a discussion around a single topic. Our most popular educational event, micro talks (aka lightning talks, similar to the popular Pecha Kucha format), are an evening of 10-minute-or-less speaker presentations; these are a great way to encourage new speakers to participate, bring in people from different but relevant disciplines, and educate members on a wide array of topics within a single event. 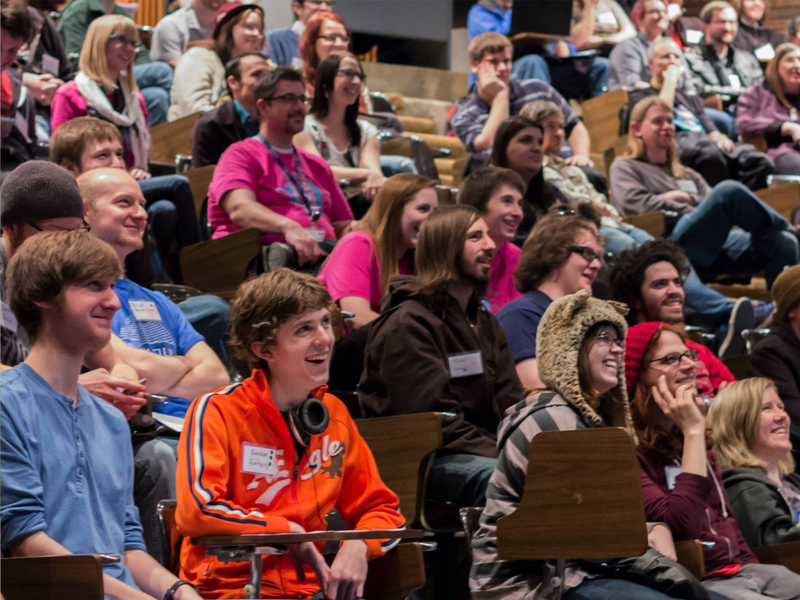 And speaking of cramming a lot into a single event, Game Jams are one of our most popular and most effective events for attracting new people and building relationships and skills. Building a game quickly and working with new people is motivational, inspirational, and fun. We try to organize between 2 and 4 local game jams per year, and they are by far our best attended events, and only appear to be gaining momentum. We try to mix up the format of the jams a bit throughout the year. 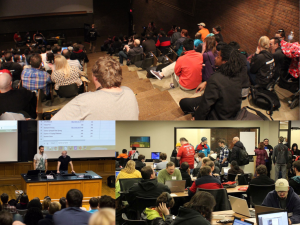 We host 48-hour on-site St. Louis Game Jams, including the local Global Game Jam site. We also host short-form Twine Jams, in which we host a brief workshop followed by an hourlong exercise with the interactive storytelling program. 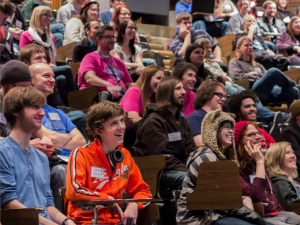 Finally, we host what we have affectionately called the “ScatterJam,” a 48-hour jam event that brings everyone together briefly for the initial theme announcement and ending demo presentations, but has everyone scatter to develop their games in their own spaces. I honestly can’t stress enough how important Game Jams have been to our community. Some of our most successful studios, games, and community members were forged in the fires of a game jam. There is a heavy organizational overhead, but every local jam has proven to be well worth the effort put into it. 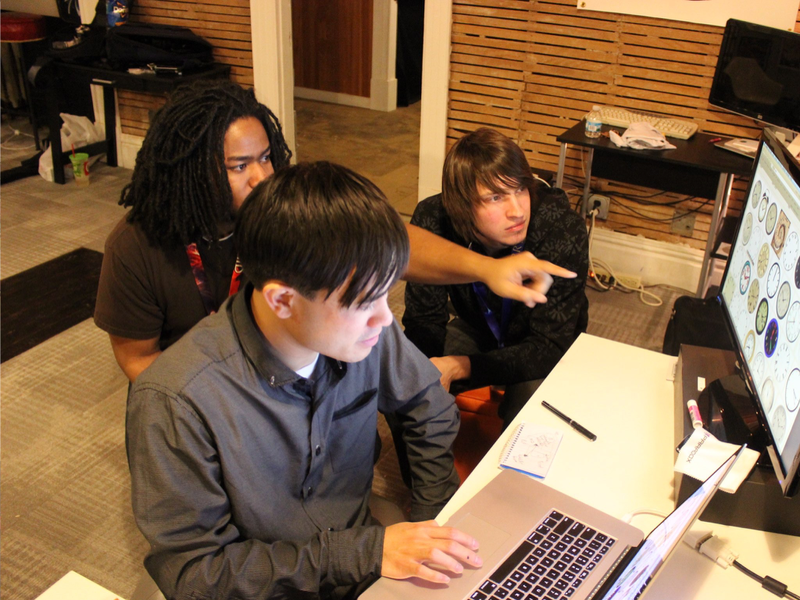 In order to build on the skills and relationships created at our game jams, some of the most experienced members of our community offer direct mentorship programs to reach out to and encourage other developers. The 8-Bit Dev Pipe, organized by Seth and Sam Coster of Butterscotch Shenanigans, brings together small teams of developers for a regimented 8-week dev cycle, so that each team can nurture the skills they need to create a polished, publishable game that they can be proud of. Providing opportunities like this to collaborate in a more relaxed, intimate setting gives everyone involved a chance to learn directly from each other without a looming sense of urgency or fear of failure. It also shows those involved how to be a good mentor, so that they can be exposed to the leadership skills necessary to help others in the future. Now that we’ve made our games, we need to play them. Community demo nights have proven themselves to be great for local developers to playtest, demo, and pitch. As indies, we often tend to hole up and don’t show games or ask for feedback until far into the process, or we may let a good game fall by the wayside due to a motivational valley. Offering and accepting honest feedback is an integral part of being a skillful and confident developer, and it’s hugely important to the quality of a community’s games. Offering opportunities for devs to bring their games to the public, show them off, and hear feedback, is crucial. If you’re feeling especially ambitious and want to basically do all these kinds of events at the same time, you can work with a team to organize a games convention or conference to give local devs direct access to a larger-scale public event. This can provide all the aforementioned opportunities and more. In St. Louis, we created PixelPop Festival. We wanted to give midwestern developers a chance to connect with the local gaming community, and to practice pitching and demoing their games in a high-visibility environment. We hosted a day’s worth of game tournaments, indie demos, developer talks, and roundtable discussions, and in doing so, we were able to create and strengthen relationships in the community, and give gamedevs and gamers both a creative and social outlet. 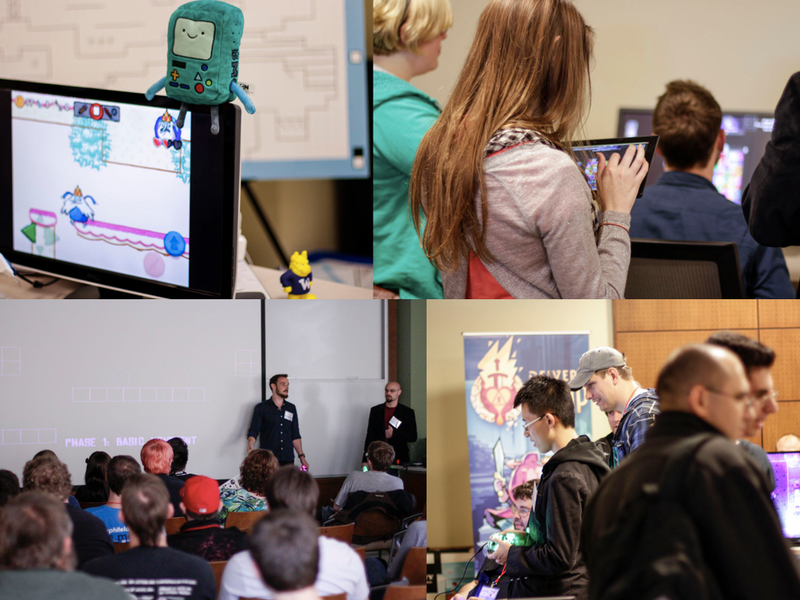 Our goal was to make PixelPop Festival as developer-friendly as possible, so we offered free demo space to anyone with a quality game, and invited game designers from all over the midwest to host and participate in the educational sessions. I’m pleased to say that PixelPop was successful enough in its first year that we have decided to bring it back for another year, and extend it to two days, hopefully providing even more opportunities for our area developers. So how do we maintain the momentum that we’ve created? We find other game developers, and we show that there is a support structure in place for them. Reaching out is a big part of creating and maintaining a welcoming games community; without reaching out to new people, your community might suffer from stagnation, a lack of diversity, or cliquishness. There are a lot of ways you can look for local developers. We look up local Kickstarter projects and message their creators, use the Twitter search tool to look for local users who talk about game dev terms, invite interested parties to participate in our local game dev Facebook group, partner with existing industry groups like IGDA or GameDevDrinkup, and partner with universities and educational facilities. We’ve also found that building up an online community has helped introduce developers to our face-to-face community. We have a popular open-forum style Facebook group, where devs announce games, post job opportunities, discuss industry news, and ask for advice. We also record a lot of our educational talks and make them freely available on YouTube, so that game developers from around the world can take advantage of the resources we’re creating. Be sensitive to the needs of your community. As new members begin to filter in, to help others feel welcome, it’s important to be aware of who is visible. As an event organizer and a woman in leadership, I attend nearly every event, and do my best to go out of my way to welcome everyone—especially underrepresented groups. This isn’t to “other” anyone, but rather to show that no one is being ignored, and that everyone is both safe and wanted within our community. From my experience, people who are often overlooked are less likely to thrive and get involved without encouragement, simply because they don’t feel welcome; this applies to gender, race, sexuality, and even, believe it or not, chosen game development styles. No one should feel lesser simply for being themselves. We have been careful to publicize and enforce safety and anti-discrimination policies, so that if issues arise, people know that they can come to our community organizers with issues and concerns, so that we can address and eliminate problems when possible. Fortunately, problems have been minimal so far, and we hope it stays that way. Organizing and keeping up with events and the people involved can be really exhausting. Ask for help; one person can’t be expected to do it all by themselves. In St. Louis, we’re lucky to have a handful of great community leaders who are always willing to step up to the plate if any one of us is feeling overwhelmed. Not to mention that the community as a whole is very supportive and encouraging, and therefore make it easy to qualify spending the time to provide them with the resources and opportunities they need. If I were to guess as to why this is, I would hypothesize that compassion and empathy beget compassion and empathy. We are also fortunate to have found gracious and welcoming hosts and sponsors for our events, like the local office of Riot Games, the Saint Louis Science Center, local universities, local studios, and tech coworking spaces who let us use their meeting rooms. Without their continued help and support, we would be constantly scrambling for venue hosts and game jam sponsors. Each year since forming our community, we have seen more new studios appear, more new games published, more relationships strengthened, and more opportunities created for all of our developers; St. Louis is becoming a mecca for indie game development. This isn’t to say that there weren’t developers in St. Louis before the community existed, but I do attribute much of our strength to the foundation we have built together. Our local indies are gaining confidence, and have become comfortable drawing from each other for help, support, advice, and talent. Like I said, we all support each other and celebrate each others’ successes, because we see everyone’s achievements as our own. This means we celebrate a lot. Many thanks to my fellow local community organizers Wes Ehrlichman, Sam Coster, Seth Coster, Stuart Keating, Jon Leek, Elonka Dunin, Ben Siders, and countless more who have helped with and attended our events. Thanks to Adam Shaw, Adron Buske, and Jimmy Britton for the wonderful photos of our community. Thank you! It’s taken a lot of effort from a lot of remarkable people to get us all to this point.